For this next trip, I’m in the strange position of having to hope not to catch more than 23 juncos. This has to do with those colored leg bands we put on the juncos in order to tell them apart. It seems that there is a general shortage of these: many colors are either entirely unavailable or backordered for an unknown amount of time. For the field season so far I have been limited to fewer colors than I expected, and I have been catching juncos faster than anticipated. By the end of our last trip, I was nearly out of color bands, not to mention distinguishable color combinations. If you’ve taken any math class that covered combinatorics, you’re probably skeptical about that last claim. I had six colors of plastic leg bands. Each bird’s band combination has to include three bands, plus a fourth of a seventh “color,” aluminum. I tried to work this out while netting last week and calculated that the number of unique combinations in that situation ought to be 4*(6^3) = 864. (Please correct me if I did that wrong, it’s been a long time since the relevant math class!) So how can I be running out of combos? The key is that I’m running out of distinguishable combos, not unique combos. To identify juncos we look at them through binoculars and try to see their leg bands. This can be tough: some colors are harder to see than others (grey and brown all but disappear); often the juncos only show us one leg. So I try to make combos that are very different from each other. Since I have a junco SSOA already, for example, I wouldn’t want to make another one SSEA—too similar. SOSA, however, is okay, because SO on one leg and SA on the other looks quite different than SS on one leg and OA on the other. Ditto LLAG and LAGG; they might be pronounced the same, but on a bird they look different. Anyway: I’m running out of bands and combos. I splurged on fast shipping for some more bands for this trip, including some strange colors that I hadn’t planned on using: purple and “shrimp.” (I’m concerned that shrimp is too close to orange, and purple to dark blue. There’s a reason that these colors weren’t on backorder, while red is…) With all my current bands in their current colors, I can band exactly 23 juncos. Fortunately, by the time I get back from this trip, more bands should be waiting for me. In the meantime, if we get close to 23 new juncos, I’ll redirect focus to other things, like monitoring our already-banded birds and searching for nests. It’s a strange situation though. 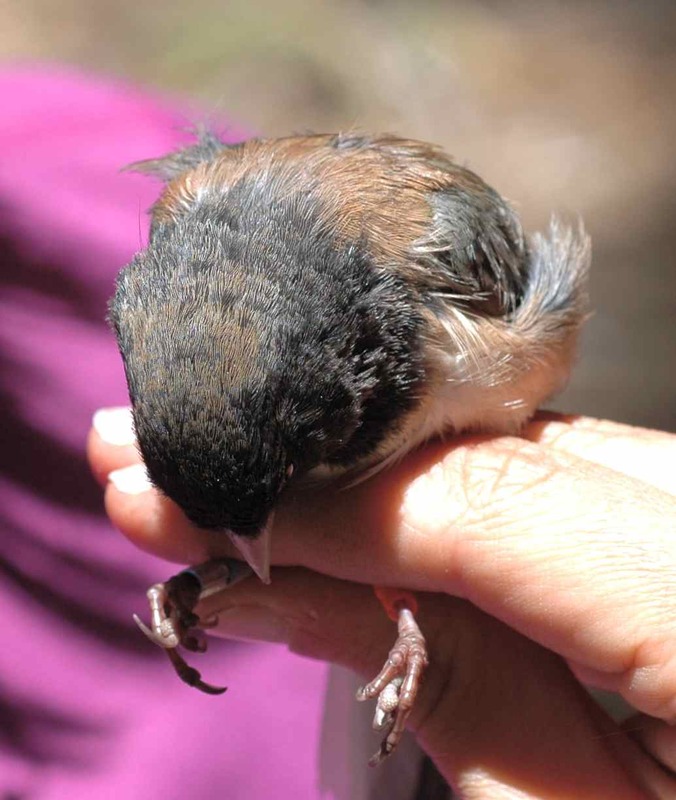 This entry was posted in field work and tagged banding, field work by toughlittlebirds. Bookmark the permalink.